On the face of it, Facebook's proposed sympathy button is a terrible idea that takes us one step closer to living in an idiocracy. Never mind keyboards: in the future all we'll need is two buttons, one with a smiley face and one with a sad face. Jane had a baby! Happyface! Nelson Mandela died! Sadface! But a sympathy button isn't necessarily a bad idea. Over at brainy chat forum Metafilter, sad news is often accompanied by a sea of full stops, commenters posting "." as shorthand for "I can't think of any way to express my sadness that wouldn't repeat what others have said or that wouldn't sound trite". It can be a surprisingly moving thing, a kind of online equivalent of a minute's silence as the scrolling screen remains wordless. Handled properly, a sympathy button might offer something similar. It's the "handled properly" bit I find hard to imagine. "Responding to a heartfelt tale of sadness with a single click rather than kind words does rather say, 'I care, but not very much'." 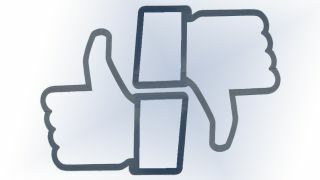 The Like button is a rather blunt instrument, and it can be misinterpreted: when someone Likes your post about bad news, are they saying they're happy that you're having a crappy time? And of course, it's often used as a substitute for proper conversation, people clicking Like when they would once have sent you a card or called you on the phone. That isn't always a problem. If you've posted something funny, or linked to something good, a Like tells you that I found it funny or good too. There's no need to explain it or expand on it. But responding to a heartfelt tale of sadness with a single click rather than kind words does rather say, "I care, but not very much." There's another side to it too. We've all got glass-half-empty types in our networks, and until now we've been able to ignore their poor-me posts because it's inappropriate to click Like. A sympathy button ruins that, enabling them to quantify exactly how much attention they're getting. Maybe it'll even encourage them to post more of the same, turning your News Feed into a Blues Feed. It's a people problem rather than a technology problem, of course: the best people in your network won't merely click Sympathise when you're sharing devastating news any more than they think Like is an acceptable alternative to a congratulatory message. But by encouraging us to connect with and to stay connected to everybody we've ever met in our entire lives, Facebook has ensured that our networks consist largely of people who care, but who don't care very much. Is the internet bringing us together or keeping us apart?